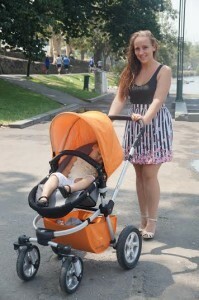 I’ve had the opportunity to borrow a Rozibaby pram to test out and review. First impressions with this pram are it is a very attractive pram, I love the look of it. They have a fun and funky colour range, especially when every fabric component is selected separately, so there’s no reason you can’t have a blue, orange and green pram and with the interactive Pram Builder, you can customise your colour choices to suit your own taste – and if that’s not enough for you to choose your colours you can order a colour swatch before you make that decision – and if THAT’S not enough, you can buy the fabric components separately, starting at $24.95 to replace the shopping basket and up to $59.95 to replace the seat unit, so it’s not excessively expensive to have “spares” to change the colour and design of your pram to suit your mood or to update your pram between children. Also, because all the fabric components remove easily from the pram, I can imagine this makes washing the pram a breeze. • The upright seat position is REALLY upright, it’s not a big feature, but it’s one of those things you don’t know you want until you don’t have it, I know my own tots, once sitting independently, definitely prefer a pram that sits completely upright rather than slightly reclined. 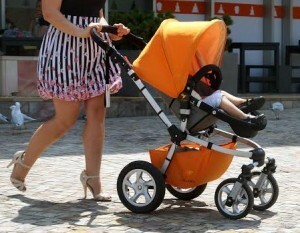 • It has rear and forward facing, which is something I look for in a pram. • It has a 22kg weight limit, this is a BIG feature for me. 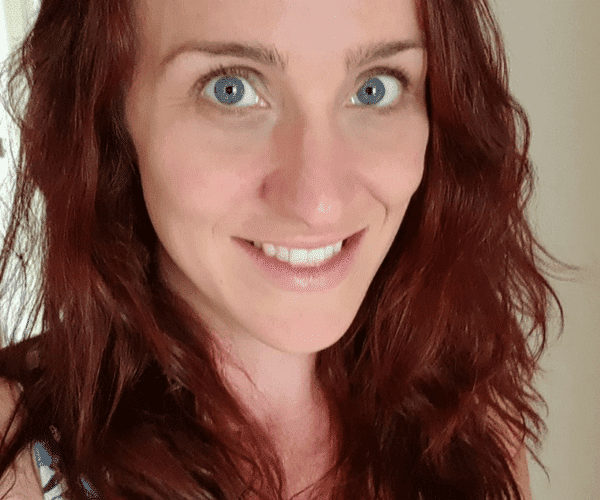 My son was 18kgs by 2 years old, which meant he’d outgrown many prams on the market as quite a few prams – especially ones as light weight as the Rozibaby – have 17kg weight limit. • It’s quite a light pram considering the overall size – between 10.4kgs and 12.85kgs, depending on what wheel and seat configuration you select. 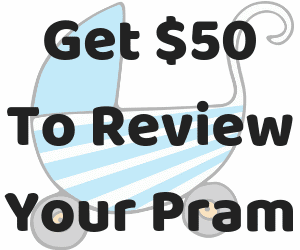 • While the main seat isn’t suitable for newborns, the bassinet upgrade is only $69.95, due to the fact that it uses the existing circle frame for the main seat, once the fabric is removed the bassinet fabric can be easily put in its place. See how HERE. 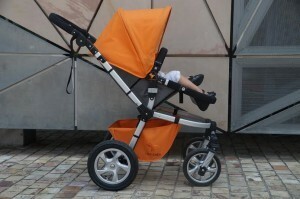 • It comes with a rain cover and sunshade included, which fit really neatly over the pram seat. • The shopping basket is a good size, for me it easily fit my nappy bag and handbag – otherwise it would fit a few bags of shopping. It also still accessible when the seat is fully reclined or in bassinet mode. 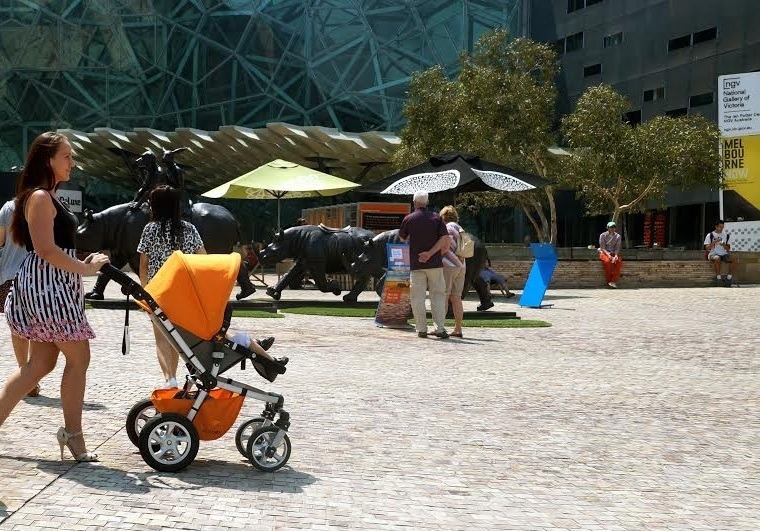 I took it for a spin on dirt tracks, grass, foot paths, hills, stairs, on a bus, around a shopping centre and through Melbourne city, and while I didn’t love it off road, even with the air tyres in, it’s not my preference for an all-terrain pram – it was a great city pram. With it’s big back wheels it handled great up and down stairs and also for getting off and on public transport – two other features that make it a great pram for public transport is the handle bar can fold completely in and under, which makes it much easier to squeeze onto a bus or busy train and the handbrake also makes it very suitable for catching buses.I would recommend getting it with the 4 wheels, because I found with 3 wheels it titled a couple of times, once the front wheel got caught on a pavement crack and again in a shopping center on a tight corner – it should be fine on a flat surface for jogging. With the 4 wheels for going across grass and uneven surfaces I found it was important to lock the front wheels to avoid them turning sideways and getting stuck – I’d also recommend locking the front wheels before going down stairs. It’s not the easiest pram to collapse – it’s a few step process as shown HERE but it’s certainly not the hardest, it just takes a little practice and it does become very compact once completely folded down – I was even able to fit it into the boot of a Suzuki Swift, which has a notoriously small boot. The wheels click off and on really easily if needed to make it even more compact. One small thing I don’t like about the pram is the seat has a two handed recline, and for anyone who’s tried to put a sleeping baby into an upright pram, a one handed recline is a big bonus. Overall, I think it’s a good pram, it attractive, it’s light, it’s compact when collapsed, it’s versatile and maneuverable. Most of all I love the interchangeable colours – that’s a really fun and exciting feature for me.